It was another lazy morning with no reason to rush. My next campsite on North Dome was only six miles away. It was quiet, with the exception of a numerous variety of bird calls. In the valley below, I watched two birds chase each other. Seeing their backs from above gave scale to the deep valley. “Let’s have cereal for breakfast,” I said. “Mmm, that sounds good, but maybe put pants on first?” I replied. “Right, good idea,” I agreed. Yes, that conversation actually happened. No reason to pretend we don't all talk to ourselves on occasion. It happens considerably more often when I've been alone in the woods. And the amazing thing is, these short conversations with myself are generally friendly chatter and not just the usual berating. I put on pants, ate cereal, and said farewell to another great campsite. 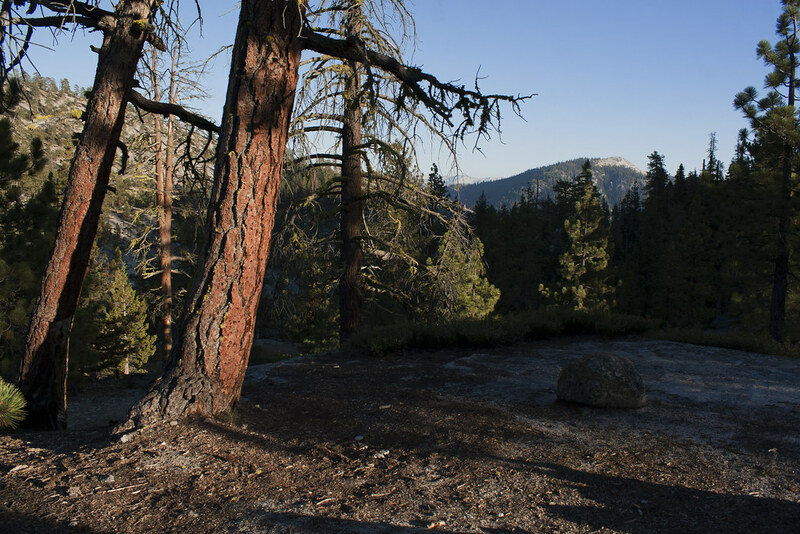 I made my way toward Yosemite Point, but my first stop today was to stare at a tree. It wasn’t exactly part of the itinerary, but the size of the tree made me stop. 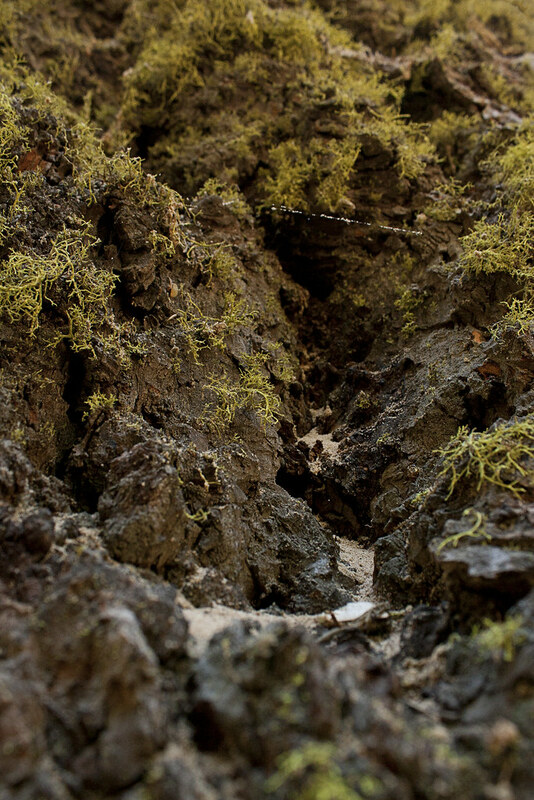 The micro-world taking place on its surface compelled me to get out my camera. 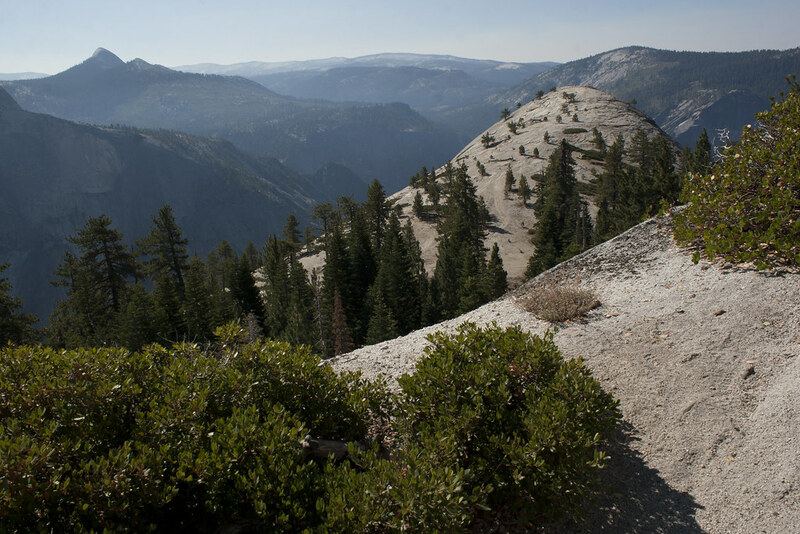 When closely examined, it was easy to see it as a world as wonderful as Yosemite itself. Every lofty pine is a planet covered in lime green moss meadows, timberland ravines and cliffs. There are grooves in the bark like tiny dry riverbeds and deep gullies. Spider webs stretch over them like tightropes and zip lines. Anyone that happened to walk by would have seen a man with his hands against a huge pine tree, leaning into it, his eyes inches from the bark, panning its surface slowly. I was engrossed in a world that I have often looked at, but never saw. I didn't actually see anyone until I got to Upper Yosemite falls. The creek was too low for the falls to draw the crowd it usually does, but I passed two couples coming up from the valley. They didn’t give it a try. 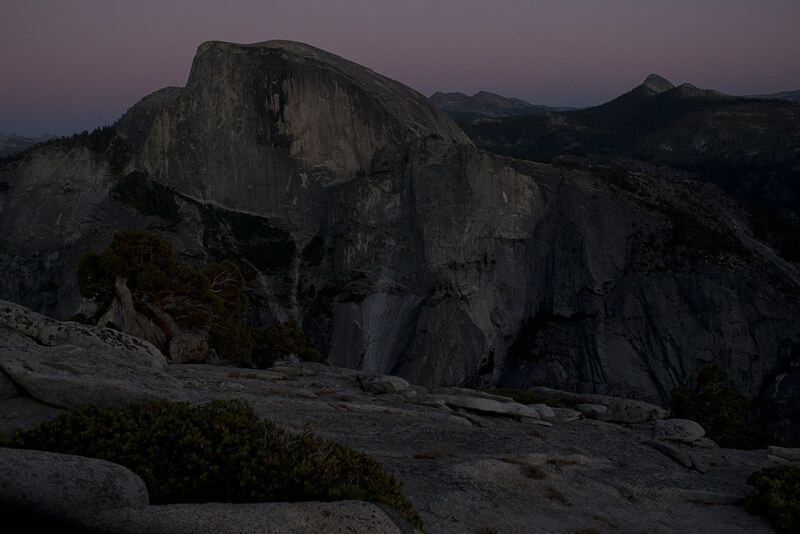 I crossed a wooden bridge over the creek then began my climb to Yosemite Point. Enduring the heat with rare moments of shade was well worth the reward that awaited me. The sky was bright blue and nearly cloudless. The sharp peaks of the battleship gray mountains rose high in the distance like big top circus tents. 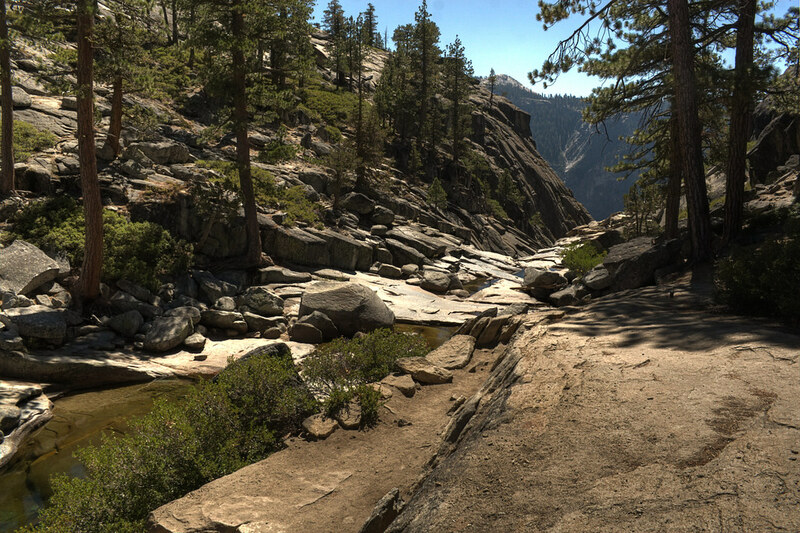 I crept right up to the edge and saw the whole of Yosemite Valley laid out before me: the village, the serpentine highway, and cars that raced along like toy Hot Wheels. The opposite effect of that micro-world on the tree. My familiar macro-world was now in miniature. When nearing North Dome four miles later, I stopped at a summit thinking I had arrived. 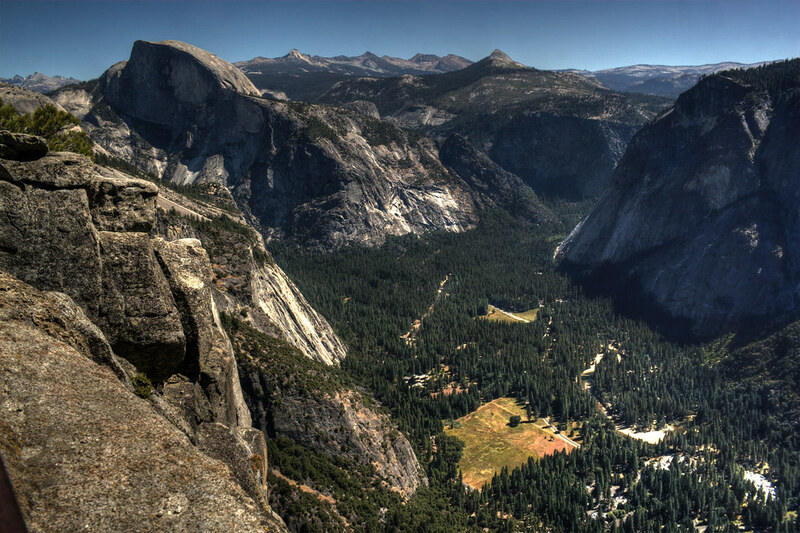 The view offered a new angle I hadn’t seen before, and was every bit as impressive as the one at Yosemite Point. It planted a wide grin on my face. It was the kind of elation that pours over you making the hair on your neck rise and your skin shiver. I was ready to put down my pack, set up camp, and stare at the view for the next few hours, but after reviewing my map I realized I hadn’t yet made it to my destination. North Dome was actually the smooth rounded peak two thousand feet away and two hundred feet below. From this height, it looked like a great white whale. Not a real one, but the version in cartoons with the disproportionately large head that slopes down to an undersized tail. I dropped my gear off on the tail and hiked along the spine to the top of the big round head. When I returned, I decided to setup camp where I left my pack. I unrolled my tent on a rectangle patch of land that had been flattened by previous tents. 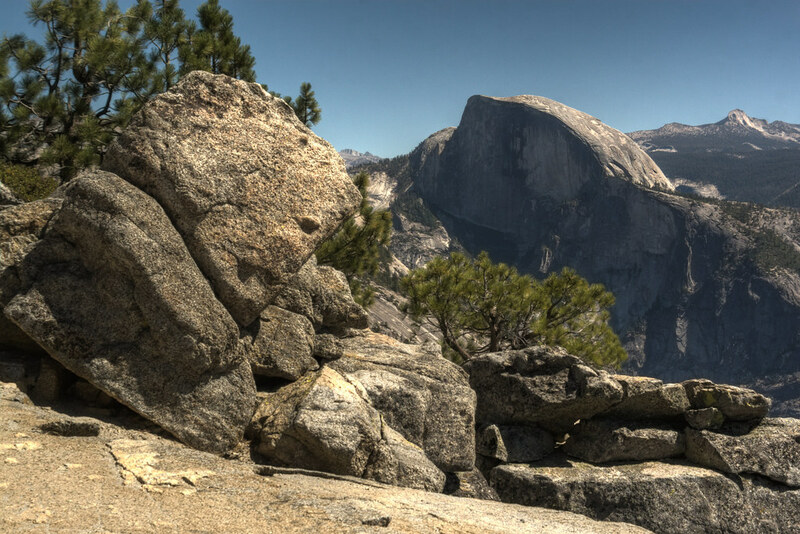 On the other side of the log there was a fire ring and an unobstructed view of the large flat face of Half Dome. What started as a tiny point in the distance, that I was hiking toward all week, was now up close and massive. 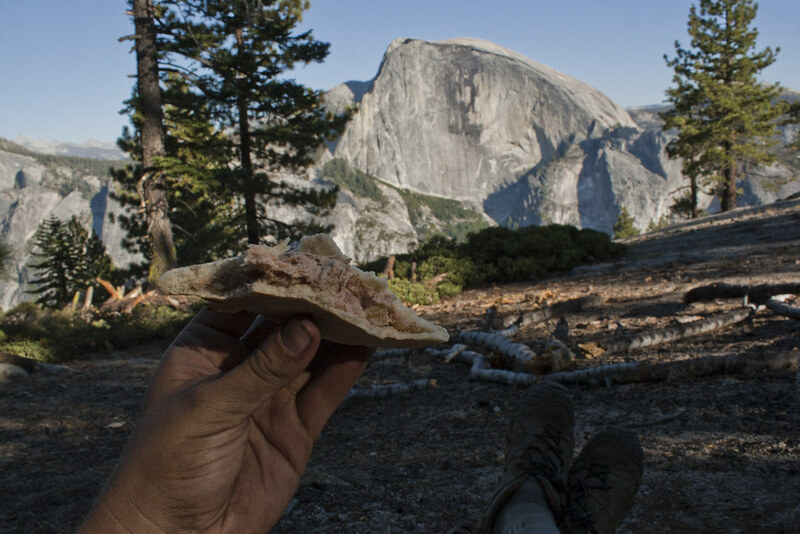 I sat on the ground against the log and enjoyed another tuna salad pita while considering my good fortune to be alive and sitting at another amazing campsite. The sun began to tuck behind the horizon. 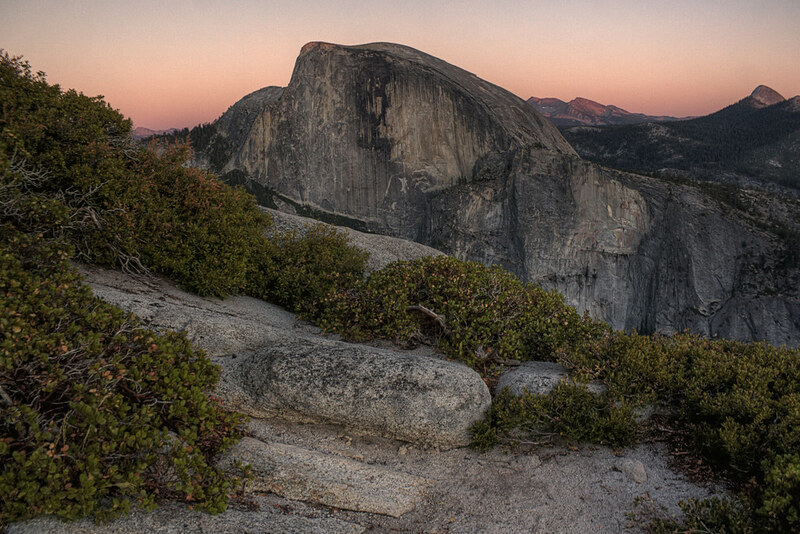 I climbed back onto North Dome as the sky turned salmon pink. 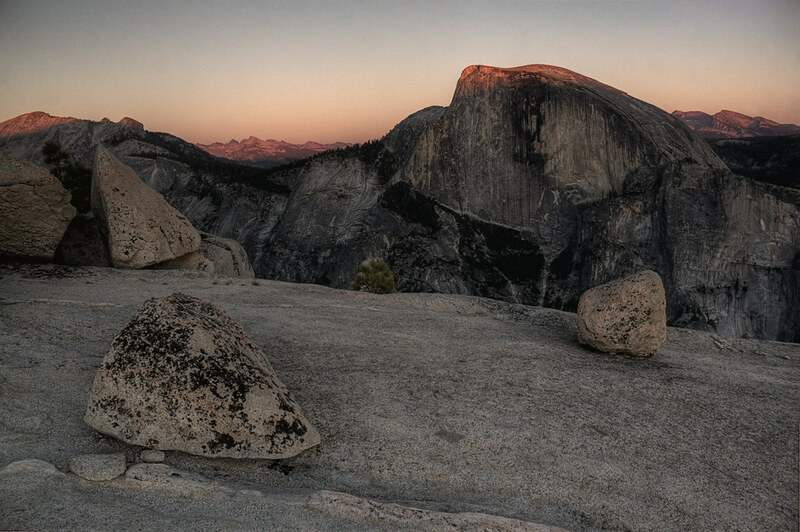 I watched a shadow creep up Half Dome until it covered all but a sunny cap on top. Soon that too was gone. Drivers heading down the serpentine highway began to turn on headlights. From up here, all that bustling activity was completely silent. I couldn’t even hear a single cricket’s chirp. It was so quiet, that occasionally I heard faint voices coming from backpackers on the other side of the valley. “There is pizza and cold beer down there,” I said to myself, all alone on the granite dome. I began to see the appeal of a restaurant or two. I found a boulder with a perfect dimple worn into it forming a comfortable seat. With the sunlight gone, and the pink faded from the sky, a few campfires on the other side of the valley popped into view. Not even a wisp of cloud shrouded the brilliance of the starlight. “Eee, eeee, eeeee.” The sudden presence of a bat fluttering above my head startled me. Maybe an hour later (but who really knows) I was beginning to get cold and sore from sitting on granite, but leaving wasn’t easy. This night has made the short list of the most amazing nights of my life. And in that ephemeral moment I wanted to memorize every mountain slope lit by the half moon, every tree forming the saw-toothed edge of the horizon, and the position of every star that hung so radiant above a view that stretched for miles. 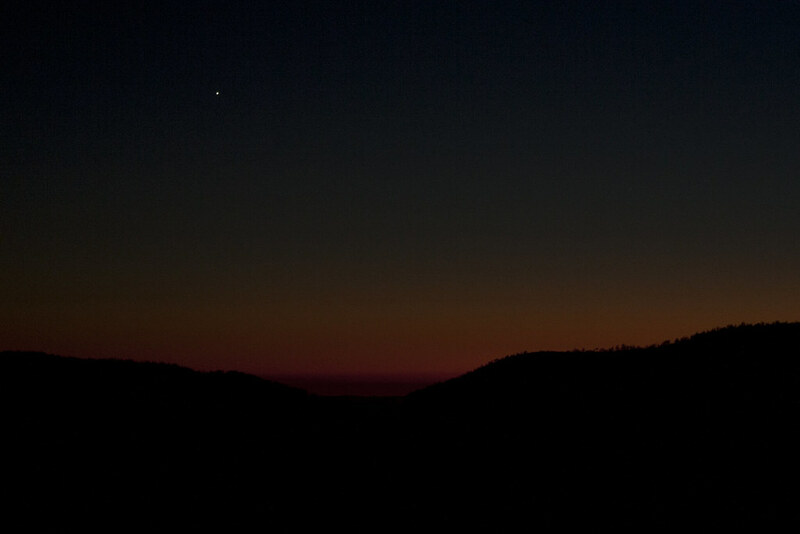 I started to head back to camp in the darkness, thinking of a warm crackling campfire, but turned for another look. 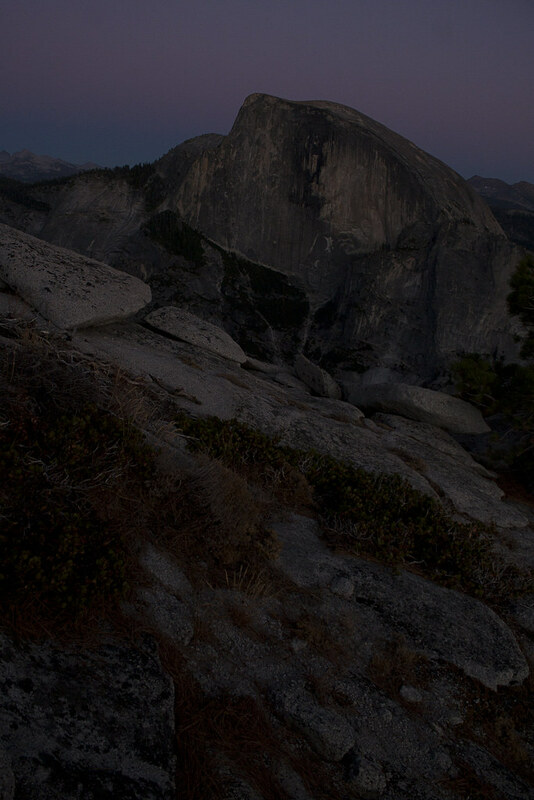 Half Dome looked so beautiful under the azure glow of the half moon. I’ll just stay a bit longer, I thought. I laid on my back and stared up at the stars. The temperature continued to drop, but I needed to feel that moment of closure when I felt like I could call it a night without having wasted any of it. In my life, most of my anxiety comes not from the bad things that could happen, but all the good things that could happen, but through some fault of my own, might not. This night was too great and too rare to allow it to end too quickly. Consequently, that “bit longer” turned into an hour. In the deep silence under the stars, my eyes kept closing slowly, but I wouldn’t allow myself to fall asleep. Just then a bright meteor shot across the sky exactly where my eyes were focused. The fiery tail lasted for a few seconds then faded away. I grinned. There was my moment, I had my closure. I wished on that shooting star that nothing had to change. Not that I didn’t want to eventually leave and experience other things, but that the way I felt never had to change. I want to feel like that always. And why not? Life is constantly offering opportunities like these if only we choose to make them happen. I know that I can’t do this all of the time, but is it more crazy to measure a successful life in moments like these, than in dollars in the bank? Everything I surround myself with in pursuit of having a comfortable life cannot hold a candle to how I feel in these moments when I have the least. I got up and stood with both hands leaning on a trekking pole. I panned around in a complete circle to see it all one last time then headed back to camp. Reflective flakes in North Dome’s granite surface sparkled. Its color in the moonlight looked like snow and even the fine gravel crunched like snow under my steps. 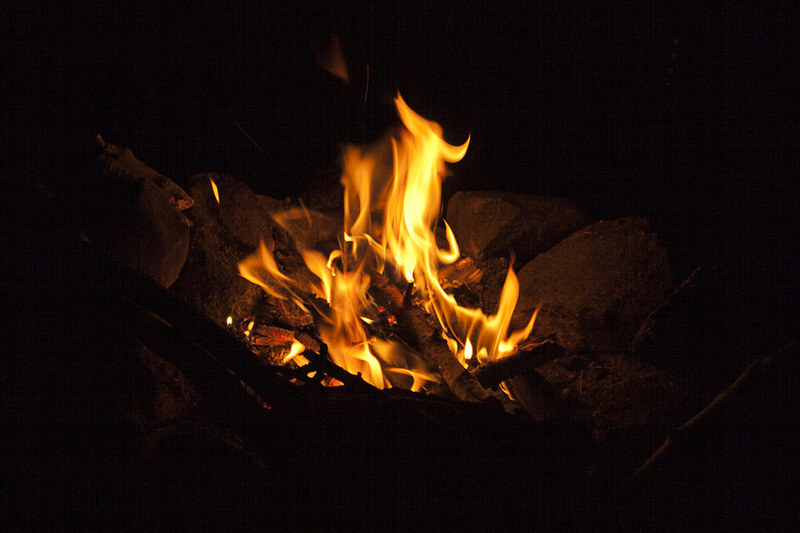 When I got back to camp, I struck a match and dropped it into the fire ring onto dried pine needles surrounded by finger-thick twigs that I arranged earlier. It roared to life in a few seconds. As it burned down, I placed wrist-thick branches on top. I warmed myself while watching them burn for quite some time. When I couldn’t keep myself awake any longer, I crawled into my tent. “But, what about bears?” several asked me before my trip. What about living a version of my life that didn’t include this unforgettable night on North Dome? Honestly, I do appreciate the concern, but the latter worries me far more.